In order to continue with the process of improving the implementation of disability rights in Peru, particular by people with disabilities, participation from all segments of society is needed. Join the movement! The RightsNow! project is honored to work with disability leaders, advocates, and allies in Peru to strengthen communities through disability rights implementation. The rights of people with disabilities in Peru are recognized under the General Law on Persons with Disabilities of 2012 (29973). Peru was the first Latin American country to ratify the Convention on the Rights of Persons with Disabilities (CRPD)—in December 2007—and ratified the Marrakesh Treaty at the beginning of 2016, which has recently entered into force. The National Council for the Integration of People with Disabilities (CONADIS), together with the Ministry of Women and Social Development, published a 10-year plan for the equalization of opportunities for people with disabilities (2009-2018). This plan has an intersectional approach, therefore a multi-sectoral commission to monitor and follow up this National Plan has been implemented. It is comprised of representatives from the ministries of Women and Social Development, Health, Education, Employment, Foreign Affairs, and Finance. Disabled People's Organizations (DPOs) are working to advance disability rights and have taken an active role in government negotiations and policy review. 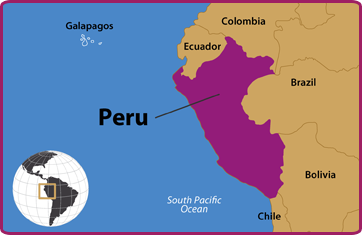 Peru was the first Latin American country to provide a review of the CRPD domestically. DPOs actively participated in the country’s CRPD shadow report, particularly through CONFENADIP (the National Confederation of Disabled People of Peru). A number of DPOs are represented, alongside other civil society organizations, in the Roundtable on Disability and Rights. This Roundtable falls under the National Coordinator for Human Rights (CNDDHH) and is actively working together to prioritize disability rights issues on the government agenda. These issues include advocacy in the sectors of health, governance and access, education, and labor. While there are a number of very good disability rights laws in Peru, many people with disabilities, particularly in rural areas, are not aware of their rights or how to ensure their rights are upheld. There is still a lot of work to do around implementation and enforcement of local, regional, and national laws. In addition, organizations have the responsibility and challenge of sharing good practices and successful experiences when people with disabilities are successfully employed. There are also initiatives to build awareness in the Peruvian business community around the concept of corporate social responsibility. RightsNow! will work with disability-led organizations, policy makers, legal experts, and other civil society actors to improve inclusion of people with disabilities, including women, children, and indigenous populations, in Peru. The RightsNow! project welcomes all people to become actively involved in moving the disability rights agenda forward in Peru using the tools and resources made available in the Global Disability Rights Now! resource center. July 2016: MIUSA partnered with the Blind Women’s Commission of Peru (Comisión de Damas Invidentes del Perú) to conduct project activities in Peru. CODIP is a non-profit organization that works for the empowerment of women and girls with visual disabilities, in collaboration with DPOs and other groups to carry out joint advocacy activities. 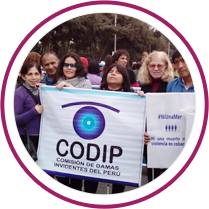 CODIP is part of the National Coordinator for Human Rights in Peru and has been working to promote the rights of people, particularly women, with visual and other disabilities for more than 15 years. November 2016: The RightsNow! project team conducted a five-day introductory visit to Lima to meet with a wide range of stakeholders to gain first-hand information on the status of the national disability legal frameworks, implementation strategies, and disability rights initiatives. U.S. experts met with leaders of DPOs, civil society and human rights organizations, and local and national government officials. May 2017: RightsNow! sent a team of U.S. experts to Lima who joined Peruvian experts on disability rights law to conduct a five-day training with 31 representatives of key human rights and disability organizations in 10 regions. Training topics included U.S. and Peruvian disability laws, enforcement mechanisms, human rights frameworks, effective policy advocacy, and training of trainers (TOT) workshops on building cross-disability and disability-led advocacy networks in urban and rural communities. May-September 2017: Twenty-two individual or group trainings were held throughout the country by trained leaders from the training held in May. These leaders mobilized 589 participants, and provided workshops focused on coalition building, local advocacy for implementation of disability laws, accessibility in education, physical access, policy advocacy, and employment. February 2018: RightsNow! sent a U.S. expert on Information and Communication Technology (ICT) accessibility to Lima to conduct 4 training workshops for government employees and other stakeholders. Workshops included presentations on basic elements of ICT accessibility, digital documents, ICT accessibility in higher education, and public procurement. May 2018: Two webinars in Spanish were held on ICT accessibility policies, web development and content management, as follow up from the ICT technical assistance visit in February. 2016-2018: The RightsNow! Consortium provided technical assistance to DPOs, CSOs and government representatives on ICT accessibility, legal aid for persons with disabilities, US disability laws in Spanish, National Accessibility Plans and implementation of disability rights laws in Peru.